There has never been more focus on municipal drinking water than right now. As the world’s largest manufacturer of activated carbon, Calgon Carbon has been helping towns and villages around the world treat and maintain safe drinking water in a cost-effective and environmentally responsible way. With 23 global offices and 17 manufacturing and reactivation facilities, we help municipalities throughout the U.S. and around the world meet evolving drinking water and wastewater regulations. Our “total solutions” approach for municipal water treatment combines the industry’s broadest portfolio of water treatment and purification technologies with comprehensive technical support and customized local services. 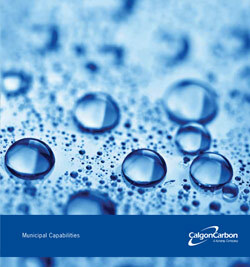 Regardless of the water treatment challenge, Calgon Carbon is uniquely equipped to engineer a solution that meets the specific performance and budget demands of your municipality. We offer technologies that can be used alone or in tandem to create customized water purification and wastewater treatment systems that meet the requirements of your community. Conserve precious water supply through UV and activated carbon technologies to destroy soluble organic chemicals and contaminants.